A thriving live-work neighborhood, NoMa is located at the center of Shaw, H Street, Capitol Hill and Eckington. 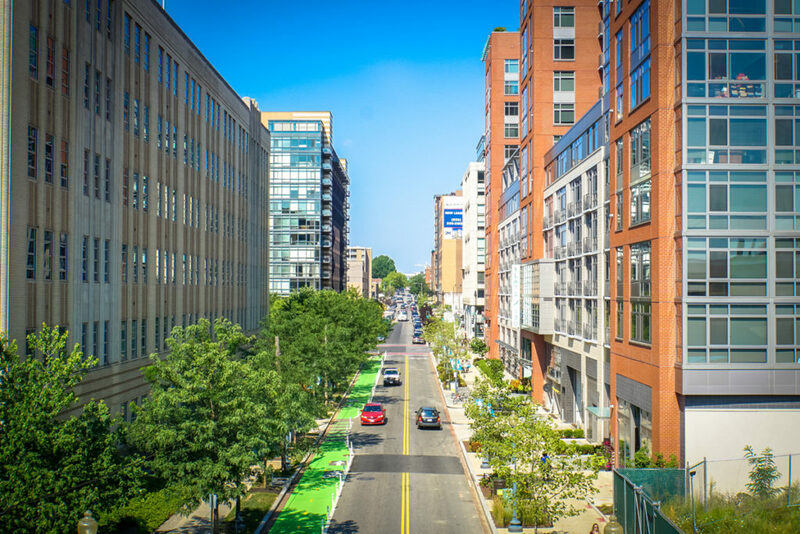 With an average of more than 111,000 pedestrians, 54,000 office workers and 11 new apartment buildings, NoMa is one of the fastest-growing neighborhoods in DC. After much planning for the area in the late 1990s, the 2004 opening of the New York Ave-Florida Ave Metro, now NoMa-Gallaudet U station sparked development in the neighborhood. The area is served by many modes of transportation including rail (via the Red Line of the Washington Metro), bus (via intercity carriers and Metrobus), bicycle (including bicycle lanes and Capital Bikeshare stations), Metropolitan Branch Trail), car, taxi, or walk the sidewalks of an area that received a walkscore of 92. Eighteen schools serve the NoMa neighborhood, from pre-K to university. NoMa includes several historic structures: the Woodward & Lothrop Service Warehouse (on the National Register of Historic Places), the Uline Arena, St. Aloysius Church, Gonzaga College High School, Gallaudet University, and the Government Printing Office building. NoMa consists of many recently developed condominiums.